We recognize your expectations for the responsible use and protection of your information and your right to privacy. To this end, Axiom Bank, N.A. will maintain standards to reasonably ensure that your information is private and secure at all times. This notice will describe how your information is used, protected, and the benefits such use provides to you. How we use, collect, and retain information about you. 4. Public sources. This information may include real estate records and telephone numbers. Responsible use of information provides customer benefits. 4. Helps us protect you against fraud. We will maintain accurate information about you. We continually strive to maintain complete and accurate information about you and your accounts. Should you ever believe that our records contain inaccurate or incomplete information about you, please call us at 1-866-331-3063. We will investigate your concerns and correct any inaccuracies. We will maintain a security program to protect your information. We are committed to the security of your financial and personal information. We safeguard information according to established security standards and procedures, and we continually assess new technology for protecting information. We restrict access of personal information about you to those employees who need to know that information to provide products or services to you. Our employees are trained to understand and comply with these information principles. We maintain physical, electronic, and procedural safeguards that comply with federal regulations to guard your non-public personal information. You may view our Security policy on our website which provides additional detail. Restrictions on disclosing your personal account information to outsiders. Whenever other companies or third parties provide services for us or on our behalf, we require them by contract to maintain the appropriate safeguards to ensure the security and the confidentiality of the information that we provide them. Because certain disclosures of confidential information are specifically required or permitted by law, we can make these disclosures even if you prefer we do not do so. Therefore, you do not have to respond to this notice in any way. We will maintain your privacy in business relationships with non-related third parties. If we do provide customer information to a third party, we will insist, through a written agreement, that the third party adheres to similar privacy principles to those that Axiom Bank, N.A. adheres to for keeping this information confidential. Disclosing our privacy commitment to you. At Axiom Bank, N.A., we value our customer relationships. We want you to understand how we use the information you provide and our commitment to ensuring your personal privacy. If you have any questions about how Axiom Bank, N.A. protects your confidential information, please contact us at 1-866-331-3063. We do not knowingly collect or use personal information from children under 13 without verifiable consent from their parents. If you prefer that we do not disclose nonpublic personal information about you to nonaffiliated third parties you may opt out of those disclosures (other than disclosures permitted by law). 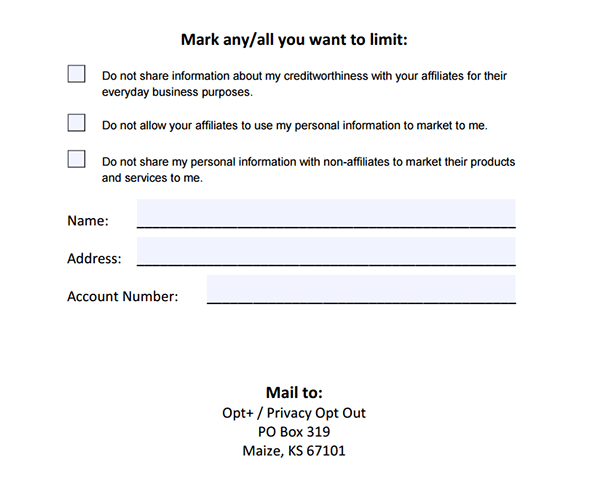 If you wish to opt out of the disclosures to nonaffiliated third parties, mail-in the bottom portion of this form. You may opt out of these disclosures at any time. This opt out, by law, will not apply to disclosures that are legally permitted or disclosures we make to companies that perform services on our behalf or to other financial institutions that have joint marketing agreements with us. Once we receive your request, we have a reasonable amount of time to stop the disclosures. You may always contact us for assistance if you wish to later revoke your opt out election.